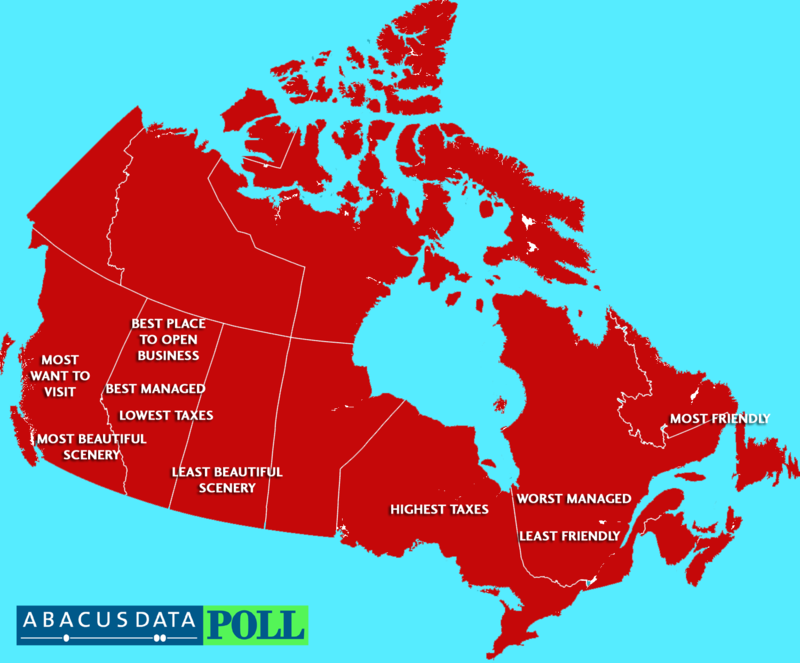 As we approach Canada Day, Ottawa-based public opinion firm asked Canadians their opinion on Canada’s best and worst provinces. The survey found that Alberta and British Columbia topped the list on five of the six positive attributes tested while Quebec topped the list in three of five of the negative attributes tested. Alberta was most likely to be viewed as the best managed province, the province with the lowest income taxes, and as the best place to open a business. In contrast, Quebec was most likely to be viewed as the worst managed province, the worst place to open a business, and the province with the least friendly people. Other winners (or losers) included British Columbia as having the most beautiful scenery and the place Canadians would most like to visit on a vacation and Newfoundland and Labrador as having the most friendly people. Ontario was perceived to have the highest income taxes while Saskatchewan had the unfortunate distinction of being perceived to have the least beautiful scenery in the country. Alberta is perceived to be Canada’s best managed province by a plurality of Canadians. Over four in ten respondents (45%) considered Alberta as best managed followed by Ontario and Saskatchewan. Alberta was the top choice in all four sub-regions of the country. Quebec in contrast was perceived to be the worst managed province by almost a majority of respondents (47%) followed by Ontario and British Columbia. Interestingly, 71% of Quebec respondents considered Quebec to be the worst managed province in the country. Alberta topped the list again as the province Canadians believed to have the lowest income taxes. Newfoundland and Labrador trailed well back in second followed by Quebec in third. Ontario and Quebec were basically tied as the province considered to have the highest income taxes followed by British Columbia in third at 16%. Considering that Ontario and B.C. have some of the lowest taxes in the country, the results present a perception problem for both provinces as a majority of respondents in each province thought their own province’s taxes were the highest in the country. Seventy-seven percent of Quebec respondents believed Quebec had the highest income taxes. It seems the grass is always greener when it comes to tax rates in other provinces. Alberta was seen as Canada’s most business friendly province with almost four in ten respondents saying it was the best place in Canada to open a business. Ontario was second with 22% followed by British Columbia and Saskatchewan at 11%. Quebec was perceived to be the worst place to open a business followed by Newfoundland and Labrador and Ontario. “Beautiful British Columbia” is an appropriate slogan for Canada’s westernmost province. One in two Canadians considered B.C. to be have Canada’s most beautiful scenery followed by Newfoundland and Labrador and Prince Edward Island. Saskatchewan topped the list for least beautiful followed by Manitoba and Ontario and Alberta in third. Saskatchewan was the top choice for least beautiful in all regions of the country. Newfoundlanders and Labradoreans are most likely to be considered Canada’s most friendly. Over one in four respondents selected Canada’s easternmost province as the most friendly followed by Quebec and Nova Scotia. Interesting, respondents were most likely to select their own province in this category. Quebec is perceived to have Canada’s least friendly people with over four in ten respondents selected La Belle Province. Ontario was second at 27% while Alberta came third at 12%. Quebec topped the list in every province except in Quebec where Ontario was considered the least friendly province. When asked which province, other than their own, respondents would most likely to visit, British Columbia was first in all regions with 29% nationally. PEI was second (17%) while Newfoundland and Labrador was third (16%). In Quebec, 24% selected British Columbia, 19% selected New Brunswick, while 18% selected PEI. From June 20 to 23, 2012, Abacus Data Inc. conducted an online survey among 1,008 randomly selected Canadian adults from an online panel of over 150,000 Canadians. Since the online survey was not a random, probability-based sample, a margin of error could not be calculated. The margin of error for a survey of 1,008 respondents using a probability sample is +/- 3.1%, 19 times out of 20. Results of the survey were statistically weighted by gender, age, region, language, and immigration status using census data from Statistics Canada and by past vote using Elections Canada results from the 2011 General Election. Totals may not add up to 100 due to rounding.